Rendering of 2764 N. Humboldt Blvd. 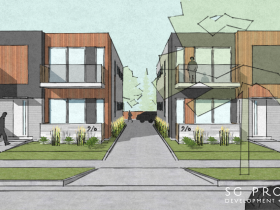 Developer Scott Genke introduced some preliminary plans for a small residential development in Riverwest on Tuesday night to a handful of nearby residents in a meeting at the Gordon Park Pavilion. He was met with some interest, and some concerns. Genke owns a patch of undeveloped land at 2764 N. Humboldt Blvd., just south of Gordon Park and not far from the Humboldt intersection with Center Street. And he wants to build two apartment buildings, each two-stories high, with a combined total of eight two-bedroom units. 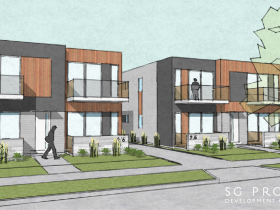 Right now the lot is zoned for an eight-unit detailed plan development. When Genke bought the land in 2016 he inherited that plan for a project which never got off the ground. He wants to make a few changes to the plan, so he needs to go through the city approval process. The $1.5 million project is ambitious, in that it’s uncommon to build new apartment buildings with so few units. Genke said the plans are designed so the buildings can blend within the context of the neighborhood — though not everyone at the meeting agreed it would do so. Residents expressed concern that the development would stick out on Humboldt. However, Humboldt has a variety of buildings with uses both commercial and residential, and with varying styles and positions relative to the street. A small number were concerned about losing the green space. This is something the city and developers run into quite often in public meetings. Residents in Milwaukee’s neighborhoods tend to use green space, regardless of its status as private or public property, like a public park. “It’s a private lot and managed as such,” Genke said, when residents challenged him about whether they would be able to walk through the lot once it was developed. Some also questioned the proposed buildings’ design. Like many recently constructed buildings, the design is modern architecture. It’s boxy and doesn’t employ the masonry or detailed craftsmanship that so many love in some of the city’s older buildings. But Genke noted that the plans he showed to the public are preliminary and don’t contain every detail that will be in the final product. Architect Jason Korb of Korb and Associates once explained the economics of this phenomenon, when faced with this question at a public meeting in Bay View for another, unrelated project. He told the crowd that if Milwaukee had an army of highly skilled stonemason emigres, like it did 100 years ago, willing to work for pennies on the dollar, developers would more liberally incorporate masonry into the architecture of modern buildings. But it doesn’t, so they don’t. The preliminary plans have the two buildings each maxing out at 26 feet tall, set back about 22 feet from the sidewalk. There’s a drive that goes between them to a 13-car garage in the back. Each two-bedroom unit will be about 1,000 square feet and will go for about $1,600 a month, with a guaranteed parking spot. The building will have a mixture of fiber cement siding and wood composite siding. Inside Genke plans to install premium finishings like stainless steel appliances and quartz countertops. 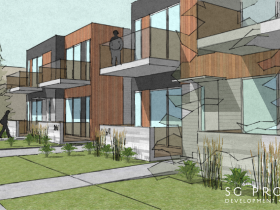 Genke’s company, SG Properties, manages more than 50 other properties in the city, and he has developed properties in Bay View and recently received approval for a new building along Brady Street. On this Brady Street project he’s planning to go through the LEED certification process. LEED stands for “leadership in energy and environmental design,” and it’s a system used by many to certify buildings with green infrastructure. Some of this includes simple steps to ensure the energy efficiency of the infrastructure, like using energy efficient appliances and furnace. He’s also planning to maintain as much green space around the buildings as possible, including some mature trees on the lot. 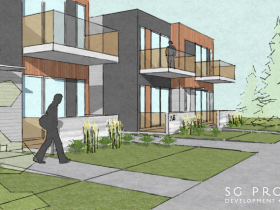 Other planned design features are a green roof on the garage and potentially, bioswales in the front of the building. And potentially permeable pavement. “These are preliminary sketches,” he told the handful of attendees at the meeting. Genke said he has a line item in his budget for a number of design details, but few things are nailed down at this point. For instance, there is a possibility the roof will have solar panels, but Genke added that he’d rather not promise until he’s certain he can deliver this. this is a good plan that would be an asset to the neighborhood. I hope the luddite neighbors don’t kill it. I believe in neighborhood continuity and quality greenspace as much as the next gal, but the idea that the community gets to decide that this private property belongs to the “community” is damaging. There’s plenty of existing greenspace in Gordon park and on the river corridor that can use more people and caretakers. let’s deal with that first. What Riverwest does not have enough of is new construction that can attract new residents and stakeholders who can keep the neighborhood vibrant. People concerned about the green space don’t understand private property apparently. The preliminary design is rather bland and hopefully gets better. Riverwest, like every neighborhood, could benefit from more residents. I’m sure Riverwest businesses would love the customers. I hate the term “green space.” Milwaukee needs to develop a vocabulary or else we’ll just get more get trash filled dust lots, highway berms, and weed-filled drainage ditches by big box stores in the name of “green space”. Is it really that hard to describe a place more specifically? A landscaped park with flower beds, a community garden space with raised beds, a playground for 1-3 year olds, a basketball court with a 10 foot chainlink fence around it, etc.. No one wants more blah-green space with a mine field of dog doo and half a broken bumper form an 06 chevy impala. We want things like a traditional landscaped park, enclosed with low hedges with a circular central patio around a modest fountain/piece of art surrounded by benches. $1600 for a 2 bedroom in RW? Damn, I need to raise my rents this is just silly. These are too expensive! We need more affordable housing, not more bland ‘luxury’ apartments in that same old tired ‘boxy’ style. Too small. If you’re going to bother building it, add more units and underground parking.